Some of his constituents have called him a nut, so perhaps the latest act of federal defendant Rod Blagojevich makes sense…or at least some cents. Blagojevich joins Snooki, comic Lewis Black, and “Keyboard Cat” as a pitchman in the Wonderful Pistachios’s “Get Crackin'” ad campaign, the Chicago Reader reports. Meanwhile, the disgraced ex-governor of Illinois awaits a retrial in April in U.S. District Court in Chicago on federal corruption charges. 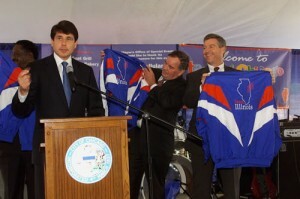 Blagojevich embarrassed prosecutors when he was convicted on only one of 24 corruption counts. The jury deadlocked on the remaining charges and a mistrial was declared. Last week, at a hearing in Chicago, prosecutors said they were working on a questionnaire for jurors, the Associated Press. His charges include allegations that he tried selling Barack Obama’s Senate seat. Posted: 12/6/10 at 9:10 AM under News Story.